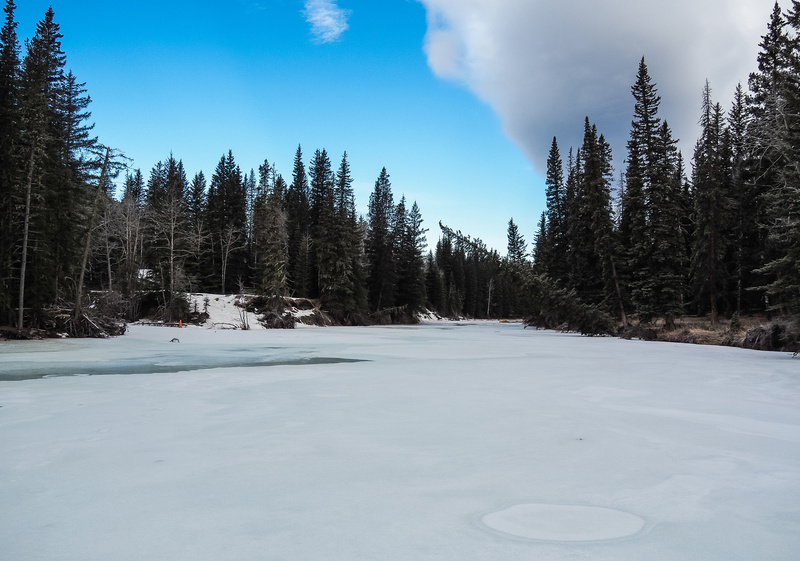 Difficulty Notes: The main difficulty on this hike is crossing the Sheep River – best to do it in late winter when it’s still frozen but the ridge is snow free. I still wasn’t feeling 100% on the last weekend of February 2016. 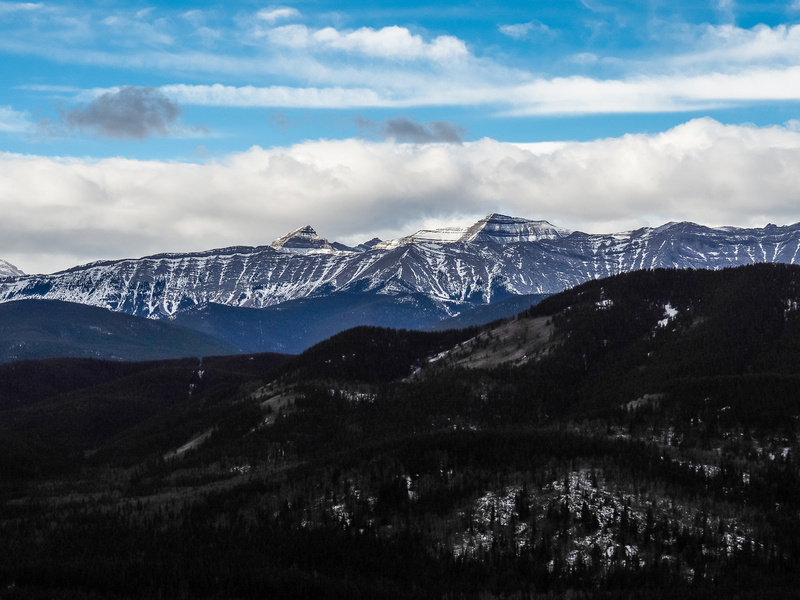 I decided that the forecast was too ‘iffy’ to try anything too lofty or remote on Sunday, February 28th so I woke up late and once again drove past Okotoks, through Black Diamond and Turner Valley and continued on to Kananaskis Country. 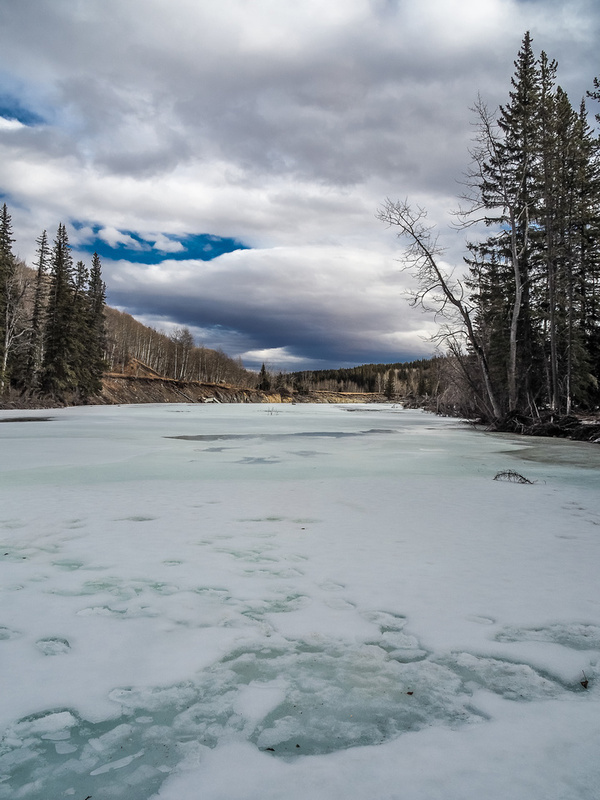 Unlike last week though, this time I followed the Sheep River along highway 546 instead of the Highwood along highway 40. The conditions were remarkably spring-like, especially compared to when I did Foran Grade and Windy Point Ridge in late February 2014. Instead of snow and -23, I was presented with practically no snow and 5 degrees! My destination was Wolf Creek Hills and Channel Ridge, both of which involved a crossing of the Sheep River. Wietse had recently done Blue Ridge in the area and told me that Channel Ridge would be bone dry. He also cautioned me to NEVER hike Blue Ridge since it was brutally boring with no views. 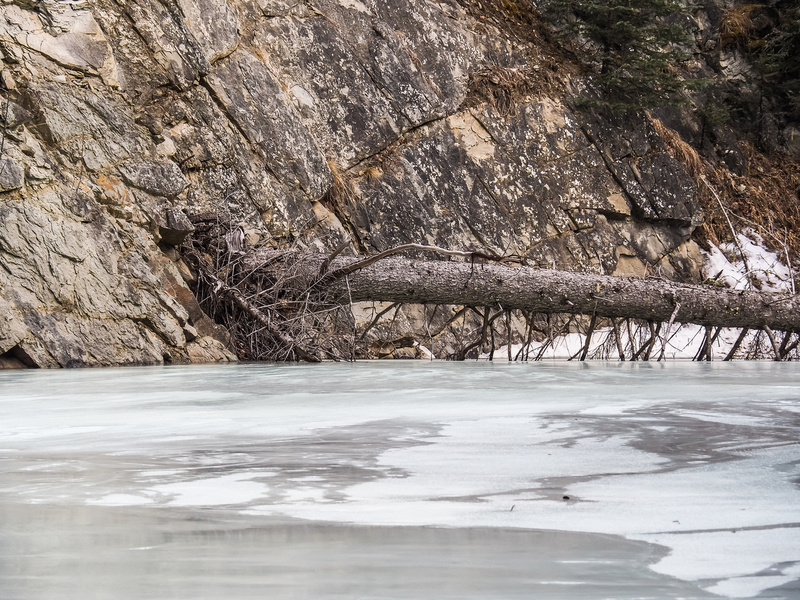 🙂 I hoped the recent warm temps didn’t destabilize the Sheep River ice too much. After parking in the Sandy McNabb picnic area, I headed down to the Sheep River to check out the crossing. The river looked frozen enough, so I tramped across it (gingerly). Thankfully it held just fine and soon I was powering along the Wolf Creek Trail. The trail was well packed and micro spikes would have been helpful on many icy sections. 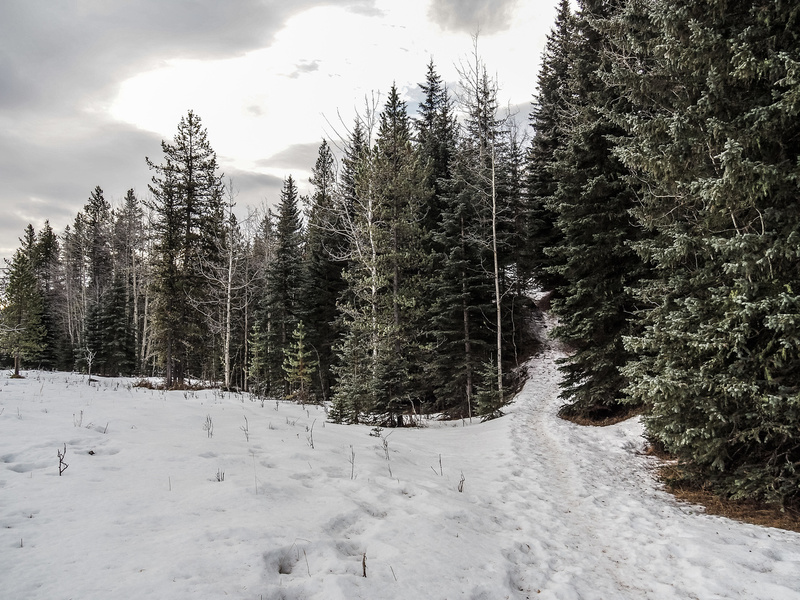 The surprising part was how little snow there was – even in the trees along the trail and on the trail itself. 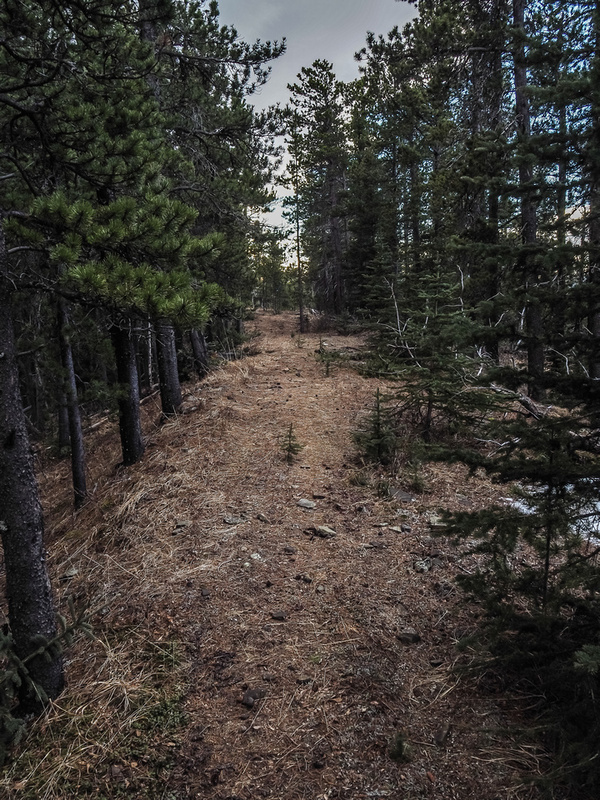 There are a few trails branching off but when I got to the first fence I turned onto the left hand trail (wide track) and followed it to the meadows between Wolf Creek Hill and Mount Dyson. 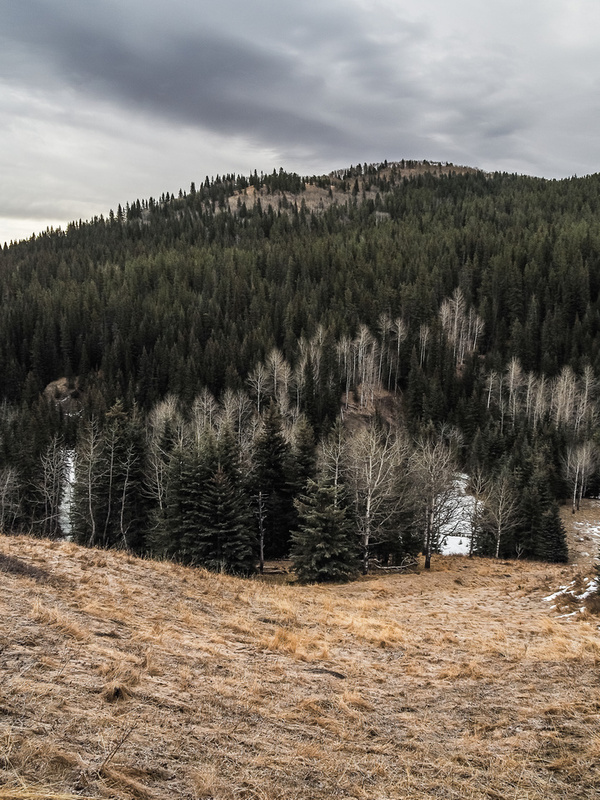 I was surprised to see an outfitter tent in a stand of trees at the bottom of Wolf Creek Hill but I powered up the small hill, enjoying the incredibly calm morning and great views. I crested the summit with no issues and admittedly felt a bit guilty about claiming this as an official summit until I realized that I did the work (i.e. getting out of a warm, comfy bed on Sunday morning!!) 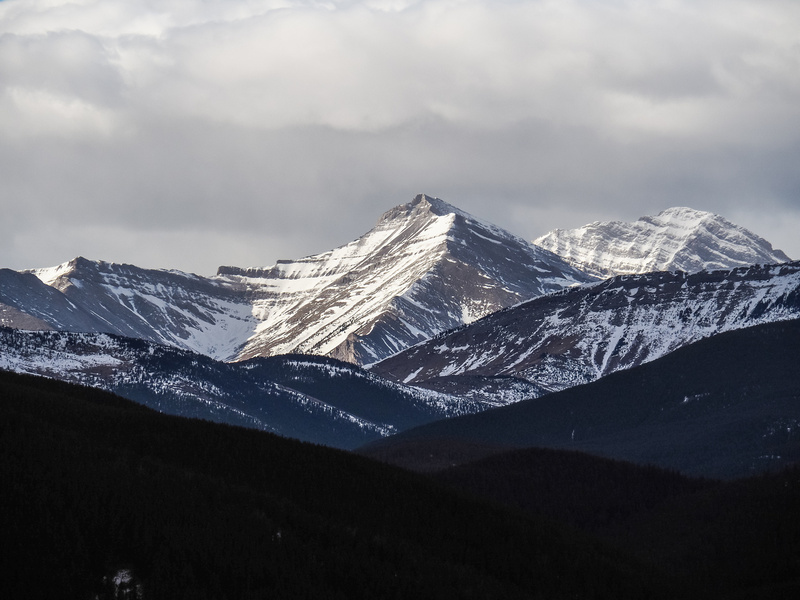 and since it’s semi-officially named I could take the credit too… 😉 After enjoying a warm cup of Starbucks coffee I turned my attention to the main attraction for the day – Channel Ridge. 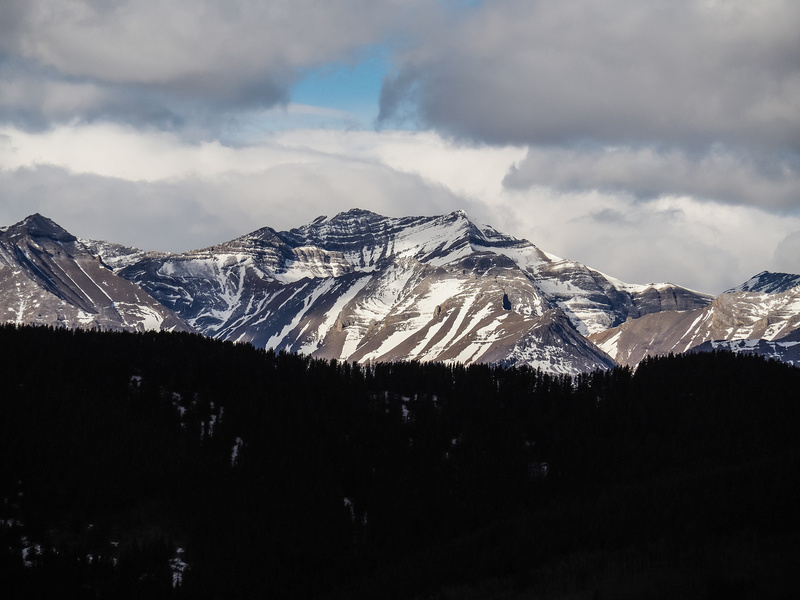 Interestingly, I could find no other trip reports on “Channel Ridge” so I was on my own when it came to beta – a rare thing for easy front range ridge hikes (and one of the main reasons it interested me). NOTE: After getting home I realized that Matt Clay calls this ridge ‘Wolf Creek Ridge’ and I also realized that Wietse and Dave S. did the exact same hike the day previous and built the pathetic looking cairn! 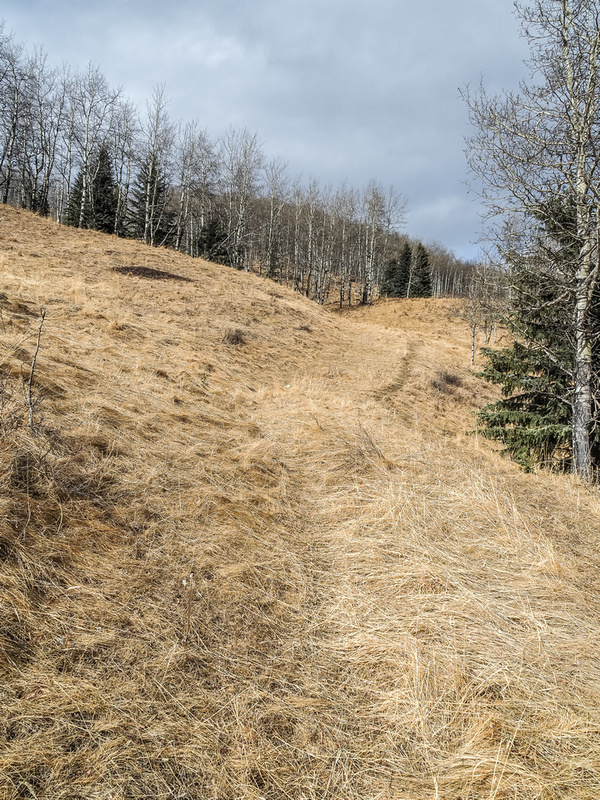 🙂 I descended Wolf Creek Hill on easy grass slopes (no snow) towards the Wolf Creek valley to the SE before linking up with an ATV trail and crossing a mostly frozen Wolf Creek and ascending a steep hill towards the north end of Channel Ridge – still on the ATV track. I left the track soon after the initial steep grunt, heading up to climber’s right and aiming in the general direction of the north summit. 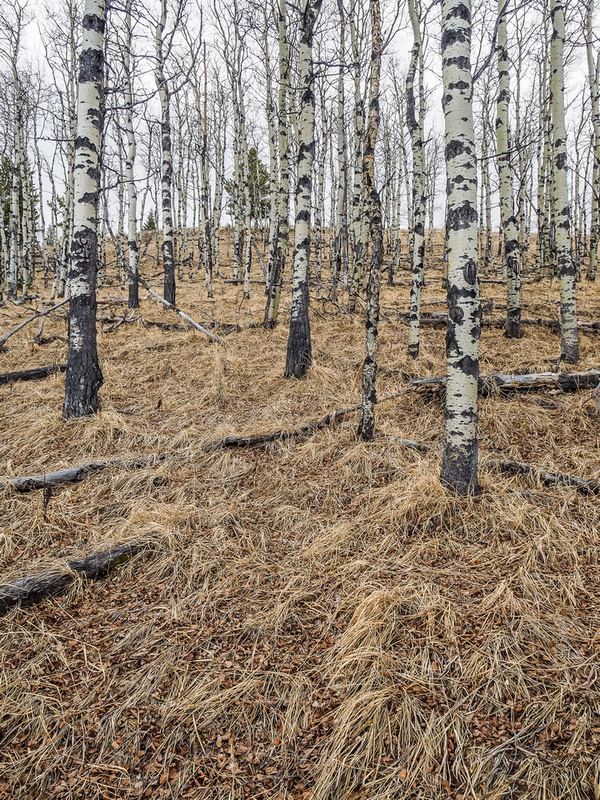 I bushwhacked through light forest and aspen trees, a thoroughly enjoyable hike on bare ground without a breath of wind. The “no wind” situation really surprised me as I had scrapped other objectives based on a wind forecast of almost 100km/h for other areas of the foothills. Either I got really lucky or the forecasts were way off. Considering the very strong Chinook arch above me, I’m thinking I got pretty lucky. Nice views from the north summit of Channel Ridge. The north summit of Channel Ridge has great views towards the west. Many easily identifiable summits are visible and I enjoyed a second cup of coffee from my thermos, contemplating life and wondering how I got so lucky with such a gorgeous, still morning. There was nobody else around and absolute silence as I sat there enjoying my own company. 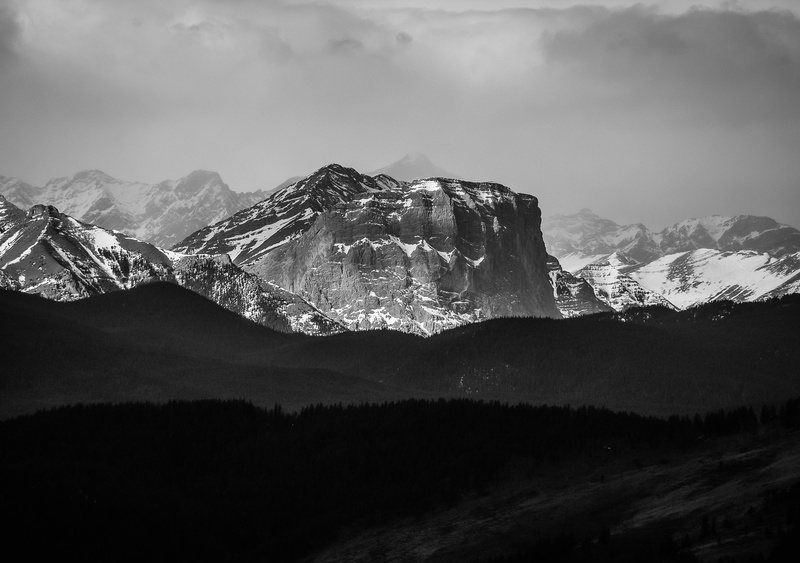 This was quickly becoming the perfect front range hike. The true summit of Channel Ridge lies about 3km south along the ridge crest, and someone had recently cleared at ATV track the entire way, making my hike extremely pleasant! With great views to the west, absolutely not a breathe of wind, and peaceful silence, I was in hiking heaven as I made my way along the bone dry ridge crest. 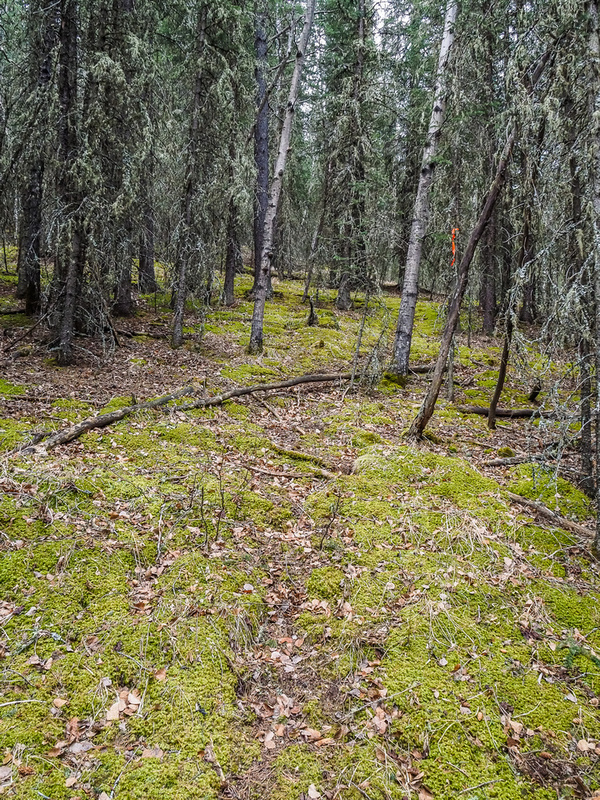 An ATV track along the entire length of Channel Ridge makes for very easy and pleasant hiking. 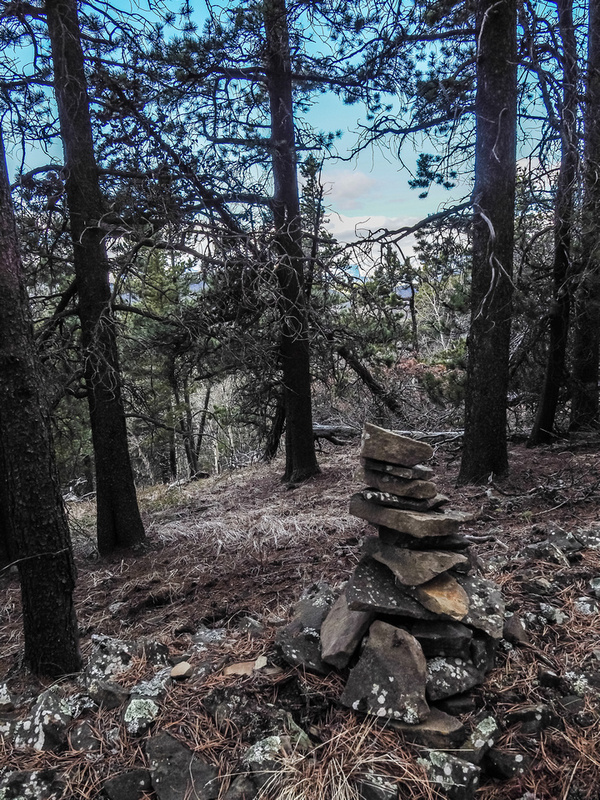 When I finally crested the high point, there was a pitiful cairn beside the ATV track to mark the spot – but absolutely no views. 🙁 If you don’t care about summits, I have to say that hiking about 1km from the north summit south provides all the views you’re going to get. There are limited views elsewhere along the ridge, but none are as good as the ones from the lower north summit. Of course, I didn’t know this at the time, so I dutifully continued south on the ridge for at least another kilometer – determined to get views to the south. 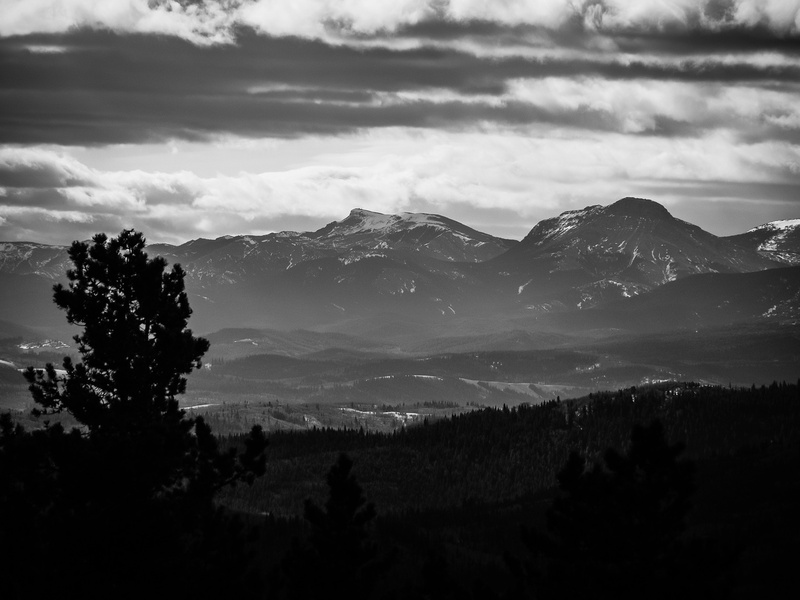 Other than a few glimpses of Mount Head and the Highwood Range I was completely skunked and finally gave up! At this point I was beyond even the ATV track (which turned down the east side of Channel Ridge) and had to regain height back up to the summit. 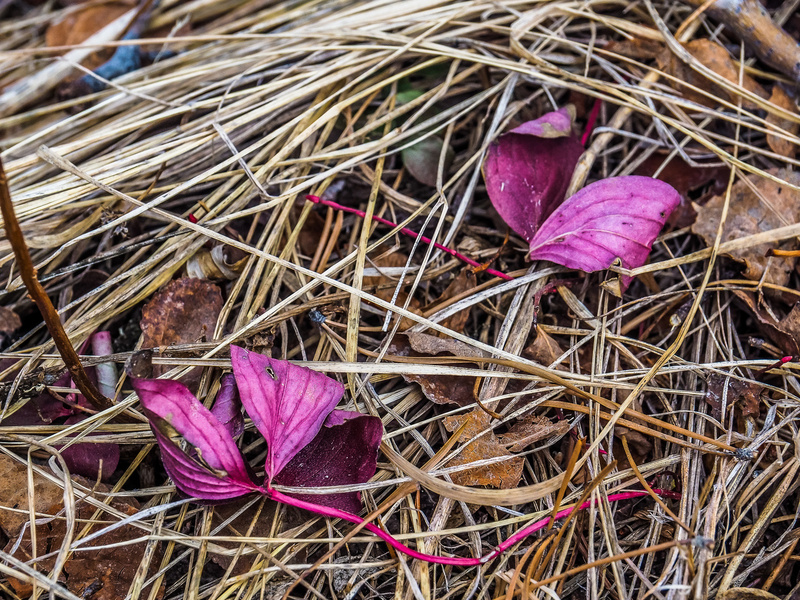 Gibraltar is always easily recognizable. Great view towards Shunga-la-she, Gibraltar, Burns and Bluerock (L to R) from along the ridge. 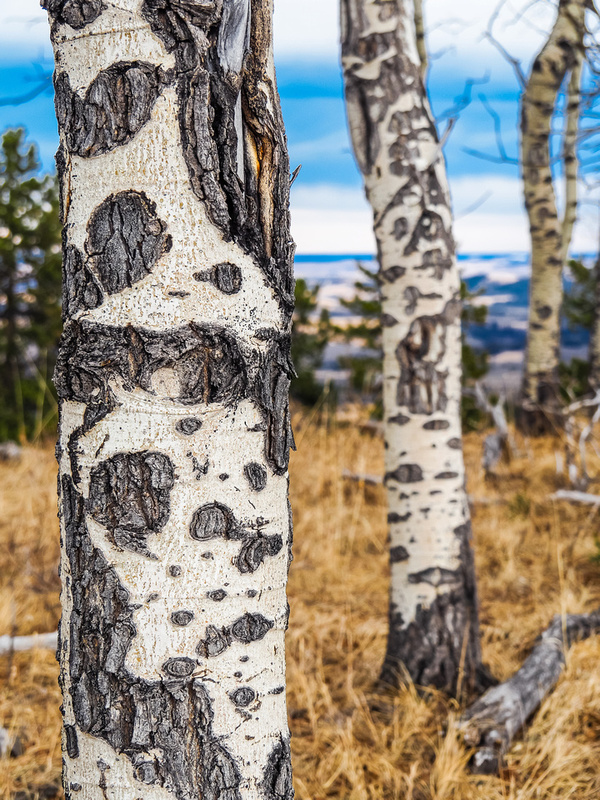 I love the patterns in aspen tree bark – there is a nice stand on the north summit that I spent some time photographing on return. The sun came out near the summit as I passed an open meadow, and I enjoyed yet another break in absolute silence, but this time with warm sunshine thrown in for good measure. Channel Ridge might be a simple hike but it was proving to be exactly what I needed this particular day. 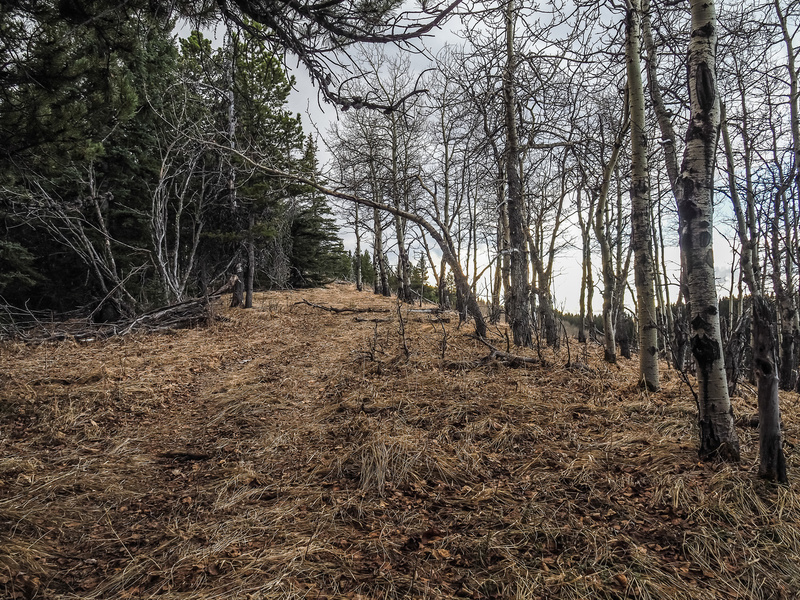 After a little snooze in the meadow, I reluctantly retraced my steps back along the ridge to the north summit. I was surprised to run into three other hikers on the ridge, and they were surprised to see me. We chatted for a bit before going our separate ways – they weren’t going all the way to the south summit but were enjoying the spring-like conditions almost as much as I was! 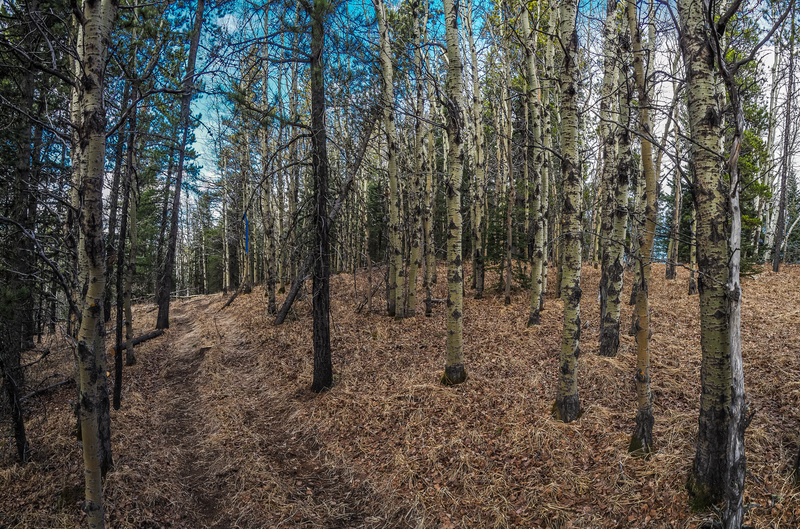 A panorama of the flats between Wolf Creek Hill, Channel Ridge, Blue ridge and Mount Dyson. On return I regained the col to Wolf Creek Hill before realizing I probably could have gone around on a trail and avoided another 100 meters of height gain but the exercise was good anyway. I re-crossed a melting Sheep River before grunting back up the road to my truck. 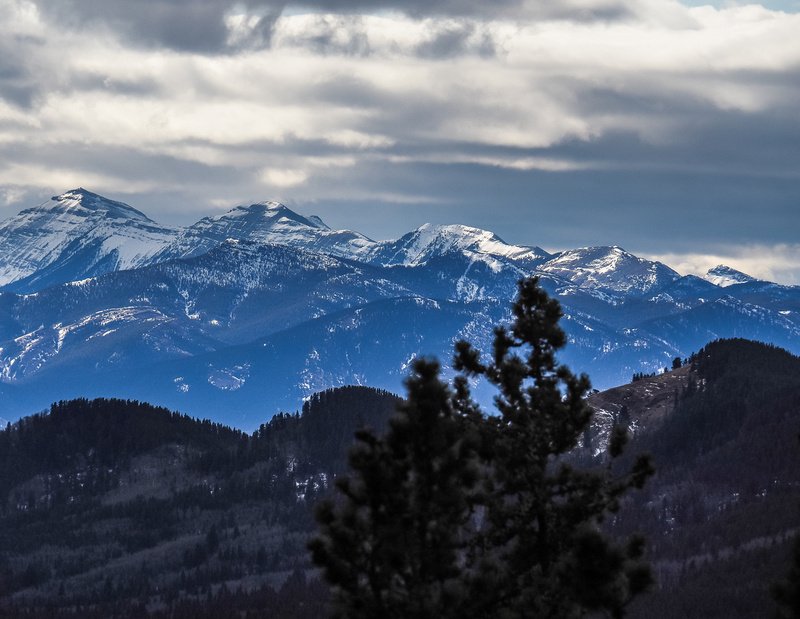 Overall, Channel Ridge far surpassed my (limited) expectations and provided me with a beautiful ‘spring’ hike. Crossing a (mostly!) 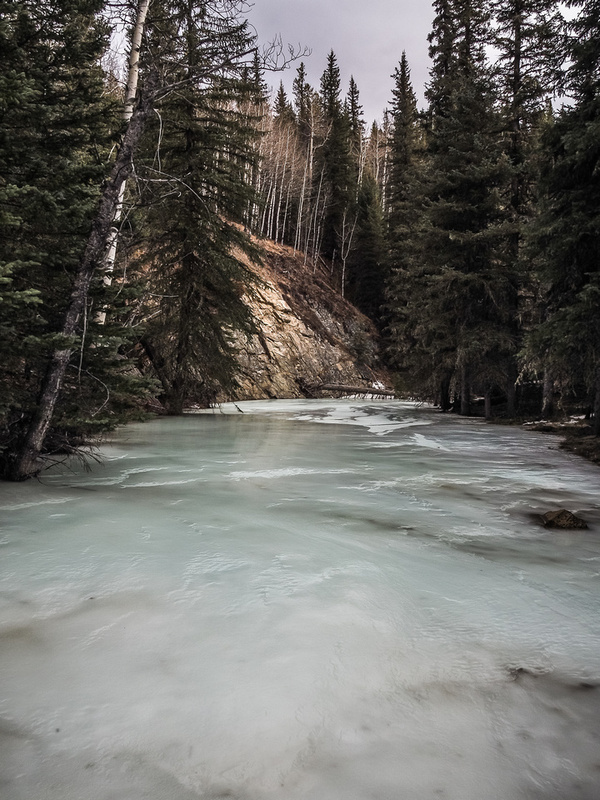 frozen Sheep River. 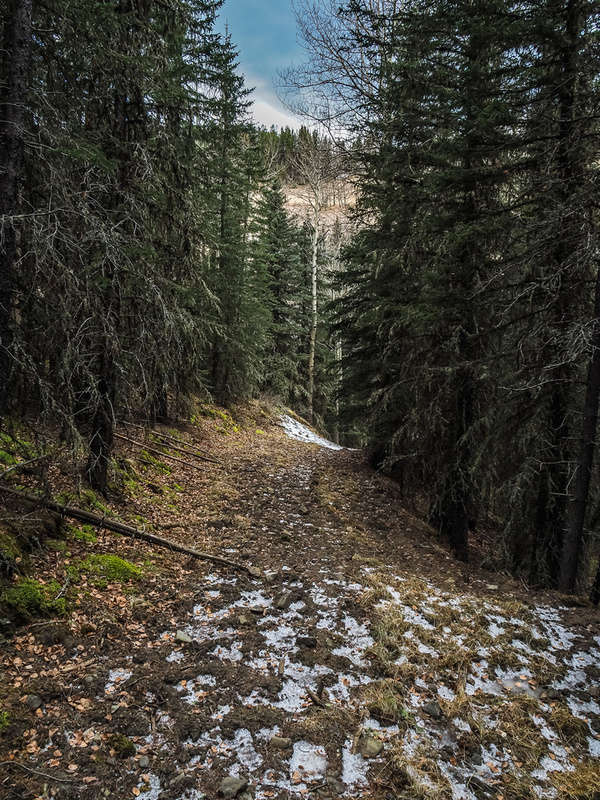 Ascending the Wolf Creek Trail from the Sheep River. This is by far the most snow / ice I was on all day. 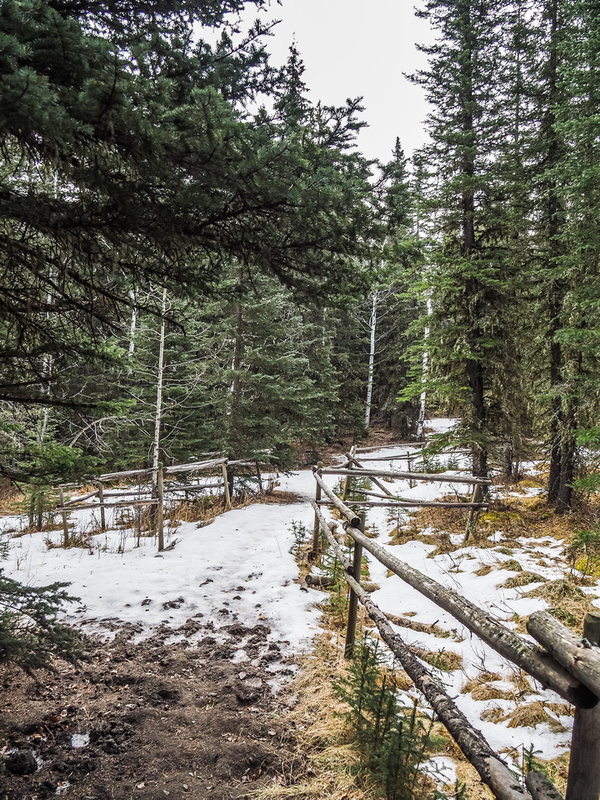 Crossing a boggy area (frozen) with some oddly random fencing that accomplishes very little IMHO. Coming out at the meadow between Wolf Creek Hill, Channel Ridge, Blue Ridge and Mount Dyson. The outfitter's tent at left and Wolf Creek Hill above on the right. Channel Ridge out of sight at right. 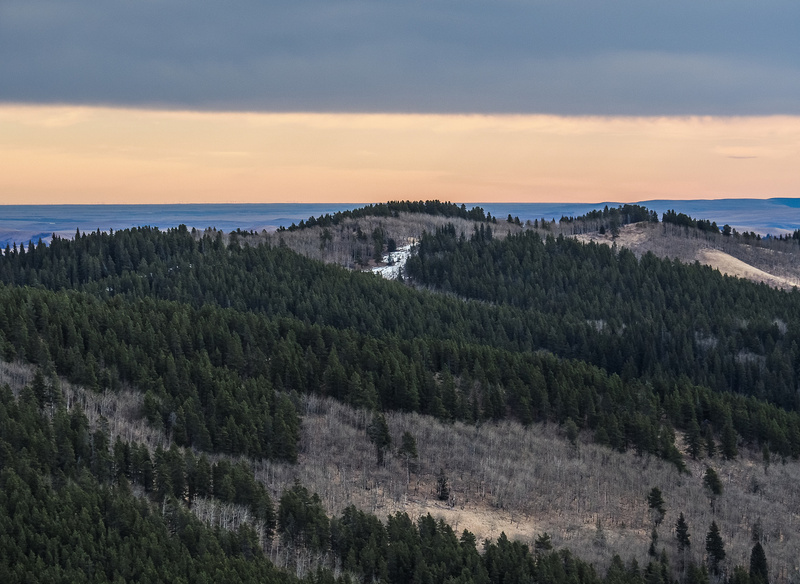 A prominent Chinook arch and surprisingly good views from the lowly Wolf Creek Hill summit. Channel Ridge at far left with Blue Ridge and Dyson to the right of it. 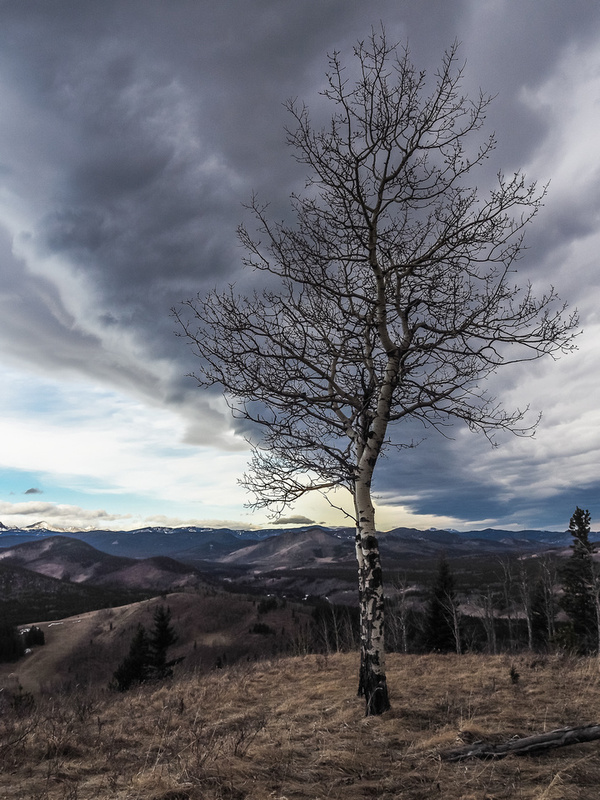 A lonely tree near the summit with the Chinook arch. Mountains in the distance include Junction and Pyriform. Starting down the SE end of Wolf Creek Hill towards Wolf Creek and the north end of Channel Ridge above. After crossing Wolf Creek, this is looking back along the ATV track that climbs steeply up the north end of Channel Ridge. I followed some tracks briefly and got excited about the ribbons until I realized they were surveyors ribbons and the trails were random animal tracks! 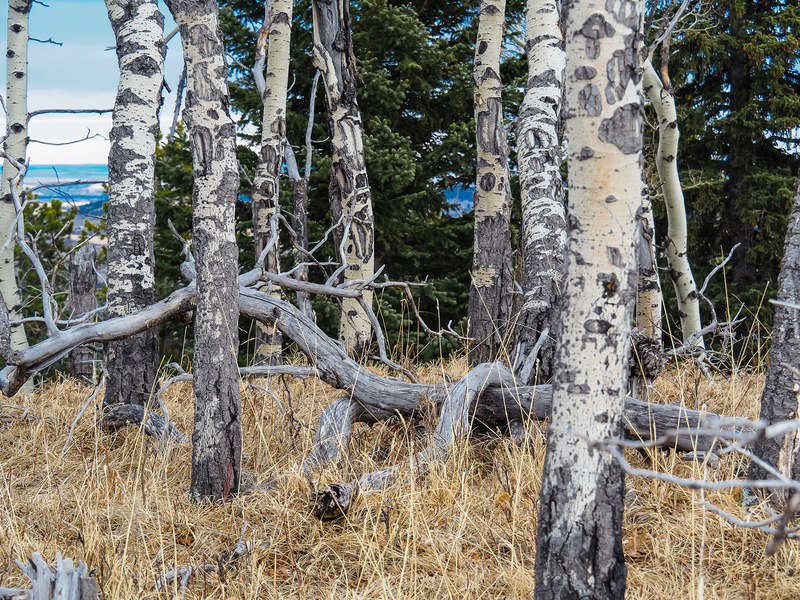 I love these aspen forests and the grassy slopes that usually accompany them. A gorgeous, still morning to be hiking solo in the front ranges. 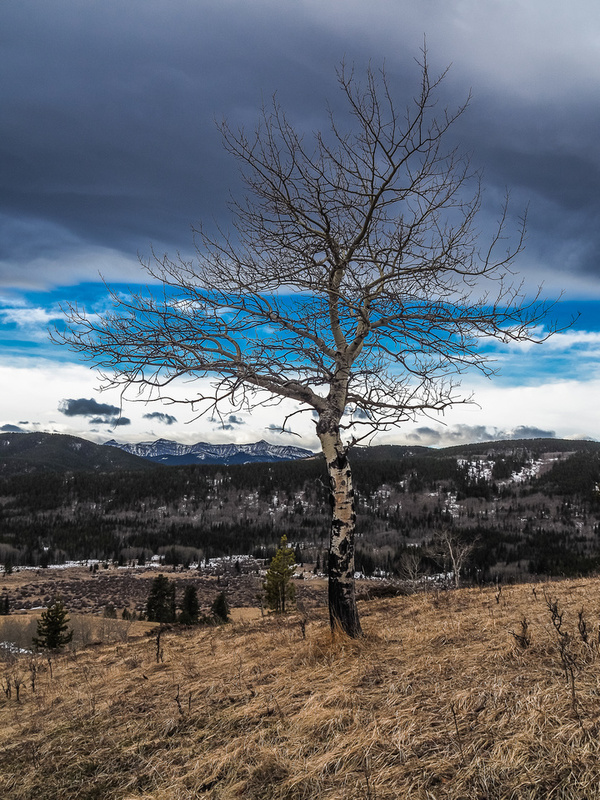 Another lonely tree - this one near the north summit of Channel Ridge. Wolf Creek Hill is far below here on the left. Tele shot of Pyriform (L) and Junction Mountain (R). 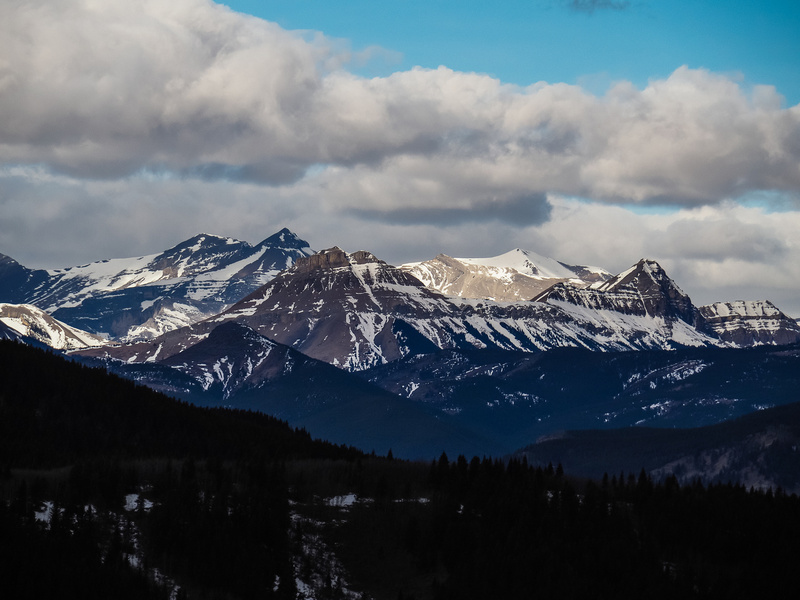 Panorama of familiar Kananaskis Peaks including (L to R), Bluerock, Cougar, Rose, Threepoint. Rose and Threepoint with Banded and Cornwall in the background. 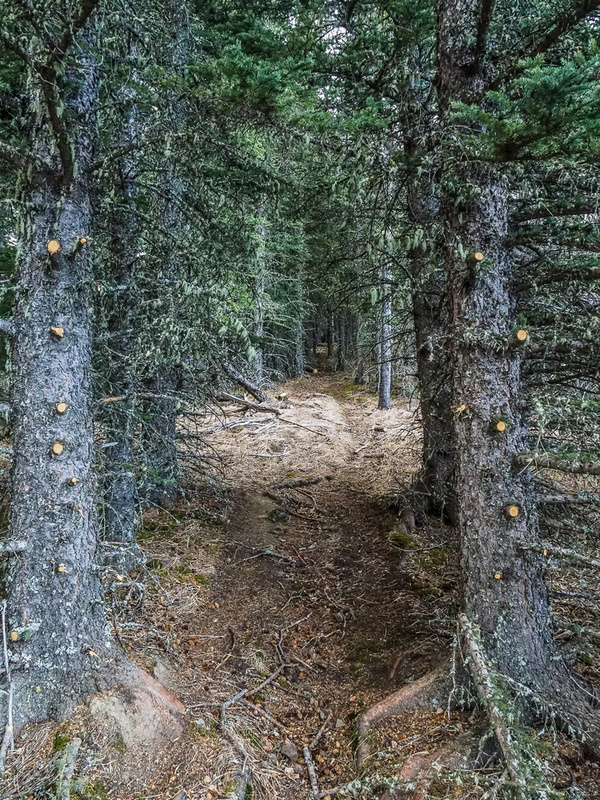 Recent ATV trail maintenance along the route. Light forest along the top of the ridge - there are more trees towards the south end, obstructing some of the great views from the north end. 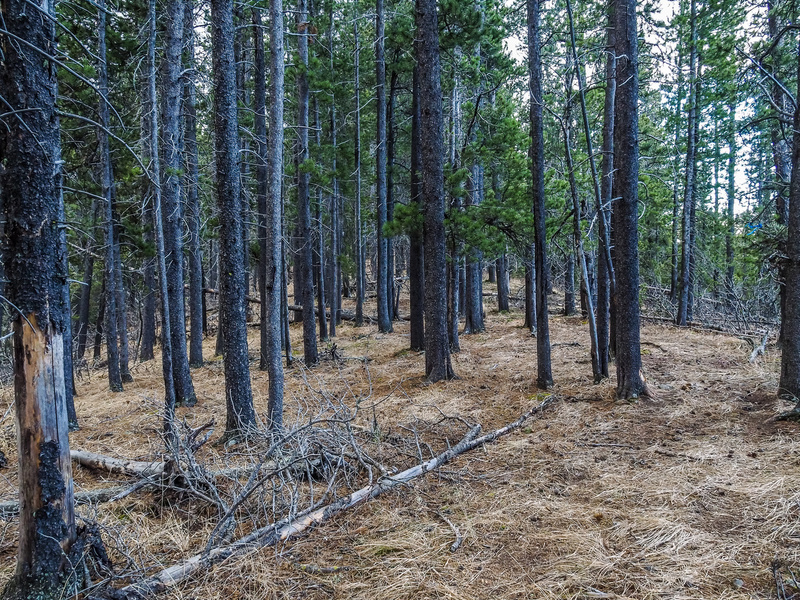 More trail along forested ridge. The rather pitiful summit cairn! I had to work for this view towards Junction Mountain. View of Blue Ridge - apparently best avoided if you like any sort of views! Apparently there's a 'Sam', 'Jim' and 'Whiskey' set of ridges to the east of Channel Ridge - but I'm not sure if they will have the same views. View over Sam Ridge to the SE. My fabulous lunch meadow, just south of the summit. 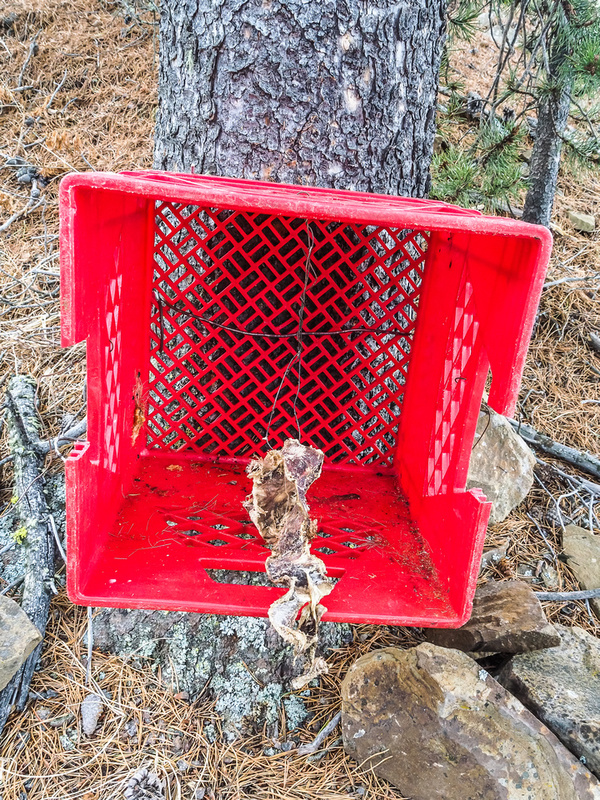 Interesting bait trap near the summit - but I couldn't find a camera anywhere so probably DNA from hair trapped around the bait is what this is for. 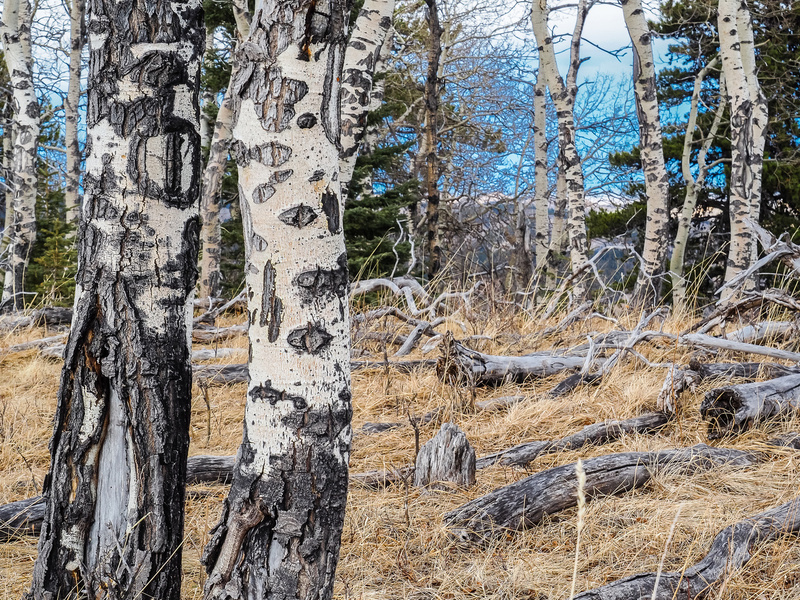 I love the patterns in aspen tree bark - there is a nice stand on the north summit that I spent some time photographing on return. Re-crossing Wolf Creek on return. I realized later that I should have bypassed this uphill section by going around it... Oh well. Looking back at Channel Ridge from regaining height to the Wolf Creek Hill col. I could have avoided the height gain by going around the hill to the right. Crossing a melting Sheep River at the end of the day.